SAN FRANCISCO—June 11, 2012— Apple® today announced that OS X® Mountain Lion, the ninth major release of the world’s most advanced desktop operating system, will be available in July as a download from the Mac® App Store™. Mountain Lion introduces more than 200 innovative features including the all new Messages app, Notification Center, system-wide Sharing, Facebook integration*, Dictation, Power Nap, AirPlay® Mirroring, Game Center and the enhanced security of Gatekeeper. With iCloud® built into the foundation of OS X, Mountain Lion makes it easier than ever to keep your content up to date across all your devices. 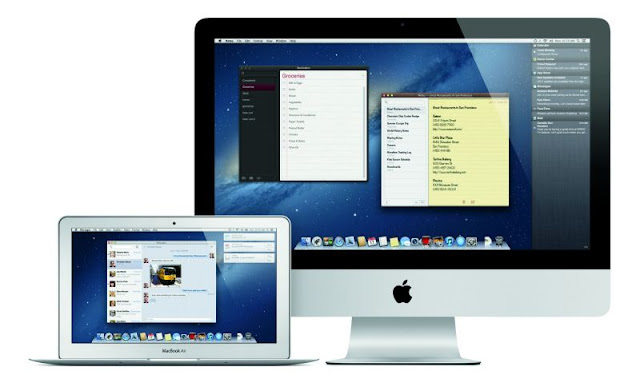 Using your iCloud account, Mountain Lion makes it easier than ever to set up your Mail, Contacts, Calendar, Messages, Reminders and Notes. The new Reminders and Notes apps help you remember important tasks and jot down your thoughts quickly, while iCloud automatically keeps everything up to date. Documents in the Cloud works with iCloud-enabled apps including Apple’s iWork® suite so you can always access and edit your documents on any device. The new Messages app replaces iChat® and brings iMessage™ to the Mac, so you can send messages to anyone with an iPhone®, iPad®, iPod touch® or another Mac. You can include attachments, high quality photos and HD video, and your iMessages appear on all your devices so you can pick up a conversation right where you left off. iMessage includes group messaging, delivery and read receipts, typing indicators and secure end-to-end encryption. The Messages app also supports traditional instant messaging services, including AIM, Yahoo!, Google Talk and Jabber. Dictation is built into Mountain Lion and allows you to dictate text anywhere you can type, whether you’re using an app from Apple or a third party developer. Mountain Lion also introduces Power Nap, an innovative new feature that keeps your MacBook Pro with Retina™ display and MacBook Air (second and third generation) up to date while it sleeps. Power Nap automatically refreshes Mail, Contacts, Calendar, Reminders, Notes, Photo Stream, Find My Mac and Documents in the Cloud, and when plugged in, downloads software updates and backs up your Mac using Time Machine®. over 1,700 new APIs that give developers access to the latest core OS and web technologies, as well as the newest features of OS X, including Documents in the Cloud, Notifications, Sharing and Game Center. OS X Mountain Lion will be available in July from the Mac App Store for $19.99 (US). Mountain Lion requires Lion or Snow Leopard (OS X v10.6.8 or later), 2GB of memory and 8GB of available space. For a complete list of system requirements and compatible systems, please visit: apple.com/osx/specs/. OS X Server requires Mountain Lion and will be available in July from the Mac App Store for $19.99 (US). The OS X Mountain Lion Up-to-Date upgrade is available at no additional charge via the Mac App Store to all customers who purchased a qualifying new Mac system from Apple or an Apple Authorized Reseller on or after June 11, 2012.